April is a month of exhibits for me. My solo show “Ephemeral and Enduring” at the Ivy Tech John Waldron Arts Center features my cloudscapes and landscapes. One of my cloudscapes — Cantata for Eventide — was accepted as part of the Indiana Artists Annual Exhibition at the Indianapolis Museum of Art. All of this exhibiting requires not only artwork, but also words. For the solo show, I needed to write an artist statement to explain why in the world I made these massive linocuts. As a rule, I find artist statements an exercise in hyperbole where the reader feels inadequate to even be viewing the artwork. 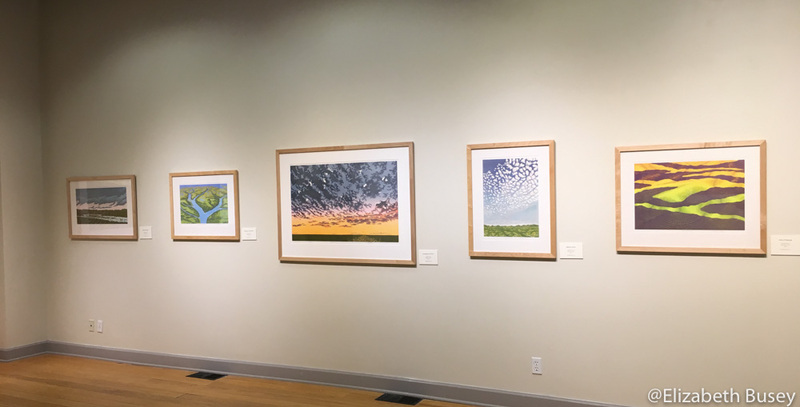 Five of fifteen cloudscapes and landscapes create a peaceful, contemplative exhibit at the Ivy Tech John Waldron Arts Center. This entry was posted in Exhibits and tagged artist bio, artist statement, Indiana Artists, Indianapolis Museum of Art, IVY Tech John Waldron Arts Center on March 31, 2017 by Elizabeth Busey. Another printmaker comes to town! 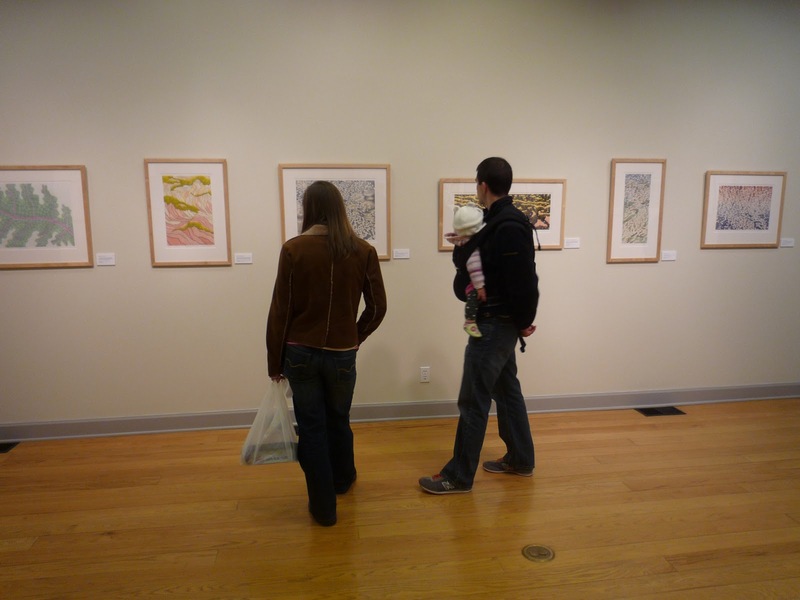 One of my New Year’s resolutions for my blog is to highlight artists that I enjoy — especially printmakers. February provides me with the opportunity to introduce you to James Hubbard, who will have an exhibit at the Ivy Tech John Waldron Arts Center in February in Bloomington Indiana. For those of you in Bloomington, you can meet James on Friday, February 7th from 5pm until 8pm. James Hubbard, Mountain Contours Through Pines. Linoleum Print, 12 x 18in, 2013. 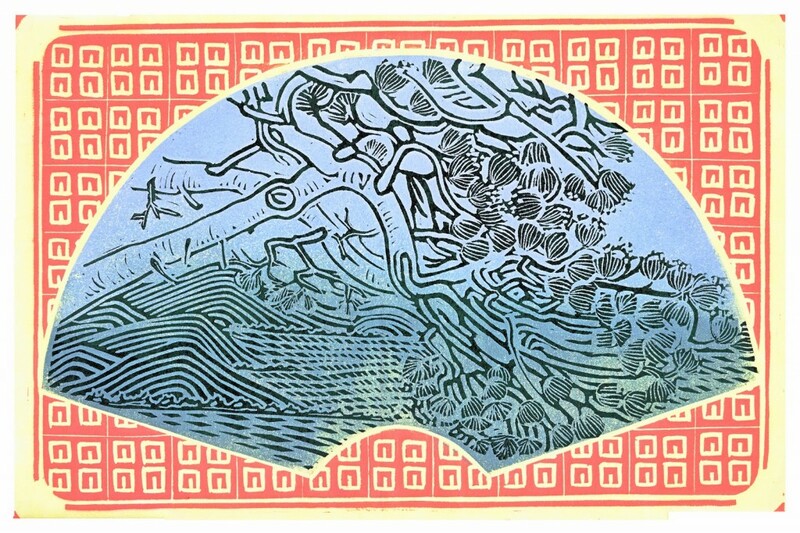 This entry was posted in Printmakers and tagged etching, Indianapolis Art Center, IVY Tech John Waldron Arts Center, James Hubbard, Linocut, linoleum, Oliver Winery, printmaking on January 31, 2014 by Elizabeth Busey. This December I have had the privilege of exhibiting my work at the IVY Tech John Waldron Arts Center’s main gallery in Bloomington, Indiana. I displayed my work according to the organizing principle of pattern. One area was for spirals, another for branching, and another for cells. Everyone has their own reasoning about why the natural world develops with such beauty, complexity and interrelatedness. No matter whether the explanation is spiritual or scientific – either way, the world is “wonderfully made”. This entry was posted in Exhibits and tagged Bloomington Indiana, emergence, IVY Tech John Waldron Arts Center, Linocut, pattern, relief printmaking on December 22, 2011 by Elizabeth Busey. I do not have traditional artist credentials, so I am always on the lookout for my own milestones. I’ve been creating art seriously for nine years, but doing so with the typical demands of children and family. So my latest milestone crept up on me. This entry was posted in Artistic Growth and tagged IVY Tech John Waldron Arts Center, milestones, relief printmaking on December 1, 2011 by Elizabeth Busey. I haven’t posted new prints for a while, because I have been working on four at once. I am scheduled to have a show in the main gallery of the IVY Tech John Waldron Arts Center in December. After a recent visit I realized that there is a great deal of wall space! The more layers of ink that I use on each print, the longer that print takes to dry. So I’m alternating between four. While this is very productive, I’m not finding this process has the same level of experimentation that I enjoy. So I’ve been looking for other areas of inspiration — and I’ve found them. This entry was posted in Inspiration and tagged Between the Folds, Indianapolis Museum of Art, inspiration, IVY Tech John Waldron Arts Center, Mia Pearlman, relief printmaking, three-dimensional on October 27, 2011 by Elizabeth Busey.